Field trialers in the Twin Cities area in the late 1980s became increasingly concerned about the long-term availability of Kelly Farms near Marine-on-St. Croix as a place to train and run trials. Other nearby grounds had become unavailable or prohibitively expensive to rent, and the spreading suburban housing growth at that time near Kelly Farms made development there seem inevitable. Several members of the three active retriever clubs in the area—Hennepin County Amateur Retriever Club, Minnesota Field Trial Assn. and Gopher State Retriever Club—began looking for alternatives. Hennepin County and Gopher State held only informal trials at the time, while MFTA held two licensed trials annually. The primary goal of the three clubs was to find affordable, usable land for trials and training far enough away from the Minneapolis-St. Paul metropolitan to avoid future development encroachment, while still staying close enough to be within a reasonable driving distance for most trainers and trialers. A quick survey of the three clubs’ membership rosters showed that approximately two-thirds of these members lived in roughly the northern half of the metro area. So we began concentrating on land north of the metro area. Becky Vien, a real estate agent and the wife of Tim Vien, one of HCARC’s members, mentioned that a 120-acre parcel of land was available along Hwy. 95, near Santiago and Glendorado, MN. Lathrop Paint Supply owned the land and had been using it as hunting area for employees and customers. The price tag: $36,500. Paul and Jackie Shidla, friends of the Viens, quickly made the down payment of $5,400.00 for HCARC. HCARC purchased the property on March 31, 1989, reimbursing the Shidlas for their down payment of $5,400 and signing a contract for deed calling for annual installments of $7,929.40 with no prepayment penalty. In a memorandum of understanding signed by the three clubs in late 1989 and effective Jan. 1, 1990, HCARC initially retained title to the property under the purchase agreement to simplify the transfer of title from Lathrop Paint Supply Co. to Benton Retriever Grounds, Inc.
BRG directors in October 1989 elected interim officers: Rick Van Bergen, chairman; Darrell Frisbie, president; Jeff Zlonis, vice president; Bob Wolfe, secretary; Don DeZurik, treasurer; Paul Shidla, Bob Beyer, Dan Morin and Ralph Dooley, other board members. The three clubs formed Benton Retriever Grounds, Inc., a not-for-profit corporation, on Feb. 26, 1990. Articles of Incorporation and Bylaws stated that “The purpose of this corporation is to: Acquire, develop, maintain and operate a facility with natural habitat for the following purposes: (1) train retriever dogs to recover shot birds in the hunting field, thereby conserving game; (2) conduct field trials to test the capability of trained retrievers, and encourage their use by hunters; (3) provide sanctuary for wild life; (4) provide for nature study and other outdoor recreation.” The incorporators were Robert Wolfe, North Oaks, Jeff Zlonis, Stillwater, and Don DeZurik, Plymouth, MN. Directors (3 from each shareholder club) were: Rick Van Bergen, Bob Beyer and Bob Wolfe (MFTA); Darrell Frisbie, Don DeZurik and Paul Shidla (HCARC), and Ralph Dooley, Zeff Zlonis and Dan Morin (Gopher State). Annual meetings are to be held in May of each year to elect officers and board members. Each shareholder club can buy non-voting treasury shares for capital contributions at the rate of one share per $100.00. These capital contributions would be used to finance capital improvements to the grounds. Operating costs were to be paid from revenues from user fees, sale of food and beverages, etc. BRG was incorporated by the State of Minnesota on March 7, 1990. Now began the hard work: Raising money to pay for the land plus to develop it for training and trials. The initial fund-raising effort by HCARC, begun early in 1989, was called “Buy-an-Acre,” the suggestion of Tom Olson, a club member. This was aimed at securing donations or pledges of $300 (the approximate price per acre paid for the tract) from field trialers, past and present, mostly in the Twin Cities area. The goal was to raise the $36,000 price tag for the land. The response throughout late 1989 and 1990 was gratifying, with approximately $28,000 donated or pledged by more than 75 individuals and by 12 state retriever clubs and organizations. In October 1989, MFTA voted to transfer approximately $15,000 to BRG to assist in retiring the land debt. Gopher State Retriever Club sponsored annual pheasant hunts at Wild Wings Game Farm in 1991-1994 to raise funds for BRG. 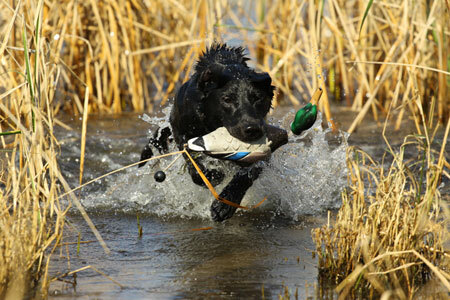 Northern Flight Hunting Retriever Assn. The second major fund-raising project involved a two-day training seminar sponsored by HCARC and put on by Jim Kappes of Reo Raj Kennels and Wayne and Bruce Curtis, both of whom had worked for Jim prior to establishing their own professional training businesses. Held Sept. 22-23, 1990, at Darrell Frisbie’s home grounds, the seminar attracted 160 participants, who were charged $45 each or $75 for couples. The club netted $8,000 after expenses. Mr. Kappes passed away from cancer that following December. The seminar was video-taped by club members George Amundson and Rick Van Bergen, and by Theresa Doubek of Central Minnesota Retriever Club. After checking on the cost of commercially producing the seminar on tape, we decided to do it ourselves because we had no idea of how many sets of tapes we could sell. Sets of six edited two-hour tapes were marketed for $79.95 to seminar participants and $98.85 to non-participants. Jacquie Anderson produced the sets of tapes, using several video recorders purchased by the club and borrowed from club members. Over the next 10 years, approximately 550 sets of tapes were sold across the country, most of them within the first year after the seminar. The only costs were the video recorders, blank tapes and shipping costs. All seminar proceeds went to BRG. 1989: The BRG land use committee, comprised of Paul Shidla, Tom Lane and Tim Vien, met in March 1989 to plan 1989 projects: Build fence along Hwy.95 and till the soil and seed grass on the grounds, which had been in corn. This committee also was responsible for meeting with Benton County officials to secure a land use permit, and to formulate proposed rules and guidelines for training at BRG. A work crew of 15 or so members of all three clubs built the one-half mile fence along Hwy. 95 during two weekends in November. At the same time, Darrell Frisbie used his bulldozer to begin clearing land around the existing water and building a dike. Earlier that fall the U.S. Fish & Wildlife Service, at no cost to BRG, plugged a man-made ditch that had been draining the water from the area where clearing began. A small sign on the main gate BRG sign today attests to the F&WS cooperative project with BRG. The disking and seeding of the main grounds was done the following Spring. Also in the fall of 1989, a planning committee was appointed to plan phases of improvements: roads, land clearing, water work, clubhouse, etc., and cost estimates. Committee members included Wayne Anderson, Paul Shidla, Darrell Frisbie, Tom Lane and Tim Vien. These estimates were presented to the BRG board at its December 1989 meeting. 1990: A long-range development committee was asked to provide recommendations on road locations and alternative sites for a clubhouse and power pole. Committee members included Bob Beyer, Richard Halstead, Wayne Anderson, Don DeZurik, Scott Offerman, Joe Kinney, Gary Thompson, Tim Vien and Paul Shidla. During the summer and fall of 1990, Darrell Frisbie used his bulldozer and dragline to clear more land around the existing slough (the west end of today’s main grounds water area) and to create new water to the east. (The dike today roughly divides the two water areas). A local contractor with a larger bulldozer was hired to help with clearing the larger trees surrounding the existing slough area. MFTA at its annual banquet in December voted to hold its 1991 licensed trials at BRG. Club members visited with neighbors to secure additional land and water nearby for holding trials. The BRG site alone was not adequate to hold more than two stakes at the same time. We were able to use the properties of six different neighbors – Joe Blank, Lester George, Ed Jenson, Bruce Talberg, Dave Lichy and Gordon Wold - during the next few years until purchasing our second parcel of land in 1999 and developing it in 2000 for trials and training. 1991: Darrell Frisbie finished the water work and used the sand/gravel material found while digging the ponds to build the original road system. Members planted over 1,000 wildlife shrubs along the new fence line bordering Hwy. 95. Don Englin, a former HCARC member and an art teacher, donated the BRG sign which is installed at the main gate. The sign was a class project where Don taught art. 1992: As seminar tape sales surpassed 400 sets, HCARC provided approximately $14,000 to BRG to pay off the last two land payments due on BRG land. Logging began in the west end of the property, with income to be applied to finishing clearing the northwest quadrant (now known as the “west end” next to the parking lot, which at the time was totally filled with trees and brush). In August 1992, the Benton County Planning & Zoning Commission approved a conditional use permit to BRG. 1993: Logging on west end was completed and a local contractor was secured to finish clearing and burning brush/slash, with the land ready to seed in the Spring of 1994. HCARC held its first licensed trial at BRG in July, with a total entry of 209 dogs. 1994: BRG leased the storage shed at Glendorado VFW (now Glendorado Town Hall) as a storage facility for freezers and equipment. (Glendorado Town Hall currently is rented as a field trial headquarters for both HCARC and MFTA.). Frisbie completed construction of mounds on the main grounds. 1996: The contractor who cleared the west end land was hired to dig the water on the west end, and to clear some additional trees/brush along the north side of the west end property. The west end water was named the “Kappes Pond,” with some of the funding coming from donations to the Kappes Memorial Fund. The Minnesota DNR during 1995 had indicated an interest in purchasing the southwest quadrant of the property, 40 acres, a dead tree slough that was unusable for training or trials. DNR said it would get an appraisal. BRG directors agreed that we should be sure such a sale would not infringe on our use of the northwest quadrant just cleared, and that proceeds would be used to buy another parcel of land. 1997: BRG began actively looking for another parcel of land to purchase. Paul Shidla, Charles Hays and Joe Prifrel were members of the land acquisition committee. 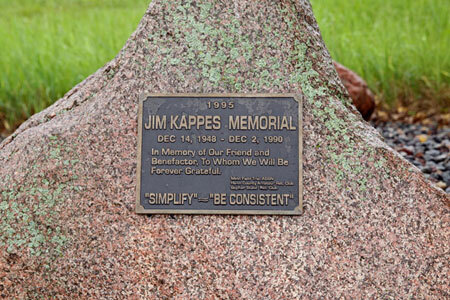 The Jim Kappes Memorial rock garden was installed at BRG. Bob Beyer was a prime mover behind the memorial. The Milaca-Benton Pheasants Forever chapter approached BRG about purchasing the southwest quadrant of the property (mentioned above), which would be donated to the DNR to be added to the existing Glendorado Wildlife Management Area just to the south of BRG. BRG offered the chapter a price of $325 an acre, with the understanding that a 5-acre buffer strip would be left along the property boundary between the southwest and northwest quandaries. The final sale was 34 acres for $10,500. 1999: BRG purchased 40 acres located one mile north of the main grounds, for $800 per acre. First objective was to clean up a pile of junk and hire a local farmer to till the high land and seed it. Once this is accomplished, BRG will no longer be dependent on other landowners for trial grounds. Water development plans for the new property were submitted to Benton County and to the U.S. Corps of Engineers. The plans include cleaning out an existing drainage ditch and creating three new ponds which would be connected to the ditch. The plans were approved, and John Herbst, the same contractor who did the west end work at the main grounds, was secured to do the dirt/water work on the new parcel. 2000: Work on the new 40-acre parcel was essentially completed until substantial funds can be raised to do more projects. On the main grounds, more work was done, inlcluding digging a meandering ditch from the west end water east to add more character to the west end field. Also, more clearing was done in the parking lot area. Long-time member Bill “Shocker” Lang passed away in April, and he had specified proceeds from his estate would be given to HCARC to be used for development at BRG. A memorial service was held on May 13 for Shocker, during which his ashes were spread on one of BRG’s ponds. In 2002, Howie Towle erected a small headstone, made by his sister, in memory of Shocker in the Jim Kappes memorial rock garden. 2002: The family of the late Wells Wilbor presented a check for $10,000 from his estate to MFTA to be used for land improvement at BRG. 2003: The main project in 2003 was to rebuild the roads on the main grounds and build a permanent parking lot and site for permanent building. A local contractor used fill from the grounds plus a stockpile of class 5 gravel that he owned. Fabric was placed within the roadbed to help stabilize it during high-moisture periods. 2004: An 18 ft. by 36 ft. shelter was constructed on the main grounds next to the parking lot to provide weather protection for BRG equipment and as a shelter for people during inclement weather. 2005-06: Electricity was brought onto the main grounds and several outlet posts were installed for use by camper trailers next to the parking lot. A project to create some new water along the south side of the main grounds attracted the attention of the Minnesota DNR, which was concerned about the project’s impact on adjacent designated wetlands. After a meeting with DNR and Benton County officials in September 2006, the DNR decided to wait until wetlands grasses are growing in the summer of 2007 to decide what actions might be taken. 2007-08: A new fence was build along the southwest side of the main grounds to prevent trainers and trialers from trespassing on neighboring property. The fencing crew included Ray Amundson, Wayne Anderson, Mark Belford, Bob Beyer, Larry Halvorson, John Lillehaug, Janet Loughlin, Rick Van Bergen and Roz Wilson. John Lillehaug, a licensed electrician, also upgraded the electrical junction box and supervised installation of underground wiring from the junction box to the equipment storage shed. During the summer of 2007, the DNR issued BRG a Wetlands Restoration Order which required BRG to move some fill that was spread on wetlands during the digging project three years earlier. Darrell Frisbie and Rick Van Bergen were the BRG “point men” who met several times during 2006 and 2007 with DNR and Benton County environmental representatives to determine exactly what would be required. The restoration work was completed in October 2007, and ground areas were seeded. Benton County environmental and soil conservation officials approved the final project, and sent a Certificate of Satisfactory Restoration/ Replacement to BRG dated Oct. 31, 2007. This was a very costly project, more than $18,000, but BRG had little choice and the positive result was an improvement in the grounds for training and trials. Ownership Restructuring: Over the years, Gopher State Retriever Club has ceased to be an active club, and has not been able to provide funds to help cover BRG operating costs. Thus, it was determined that BRG needed to restructure its governing board to reflect that ownership now is made up of two shareholders, HCARC and MFTA. The two clubs share in financing annual operational costs. The BRG bylaws were amended late in 2008 to change the board structure to include four members each from the two clubs, for a total of eight board members. Each shareholder club voted to accept the bylaw amendments. The current board: Rick Van Bergen, president; Yvonne Hays, secretary; Mark Belford, treasurer. Board members: MFTA: Larry Halvorson, Rick Van Bergen, Yvonne Hays and Gary Metzger. HCARC: Mark Belford, Wayne Anderson, Mitch Mills and Ray Amundson. 2009-2010: Several years of relatively dry weather had severely impacted the water depth of our ponds, particularly in late summer. The decision was made in 2009 to drill a well on the main grounds. A local well driller was contracted and found sufficient water, at less than 50 ft., which also was potable. Pipe was laid from the well to both the west end pond and the main ponds to the east in October 2009. Testing in the spring of 2010 found the system working well. A separate faucet atop the well provides water for campers and other uses at the parking lot/campground. Also in 2010, fencing was completed along the east boundary of the main grounds. 2010-2011: A major improvement project on the north grounds was begun in 2010 and completed in 2011. The ditch on the north side of the parcel was widened, meandered and sloped to help avoid potential dog injuries and provide new training/trial challenges. The current ponds were widened and expanded. Finally, a road system was installed from the west gate south and then east to the south mound. Fill from digging the ditch and ponds was used as a road base and to build several new mounds. 2012: A bridge consisting of a large culvert topped by fill was constructed over the ditch leading into the north grounds, allowing traffic to move to the east from just inside the west gate. This should help minimizing vehicle parking along the gravel road during trials, always a safety factor as well as an irritant for local traffic, especially farmers with large farm equipment. Also, a 40 ft. long used shipping container was purchased to store all club equipment which until now had been stored in a building in Glendorado. It is on the parking lot at the main grounds and has been wired for lights and electrical outlets. The new storage unit is much handier for club events, and will pay for itself in a few years from savings from no longer paying rental on the Glendorado facility. 2013: The storage unit purchased in 2012 has been finished, with shelves installed and the interior reorganized for most efficient use for all equipment and refrigeration/freezer units. The exterior of the unit has been painted. The tractor/equipment shed has had sidewalls added to help protect equipment from weather. Stored inside the shed are two tractors, three mowers and our gopher poison machine. 2014: Officers/Board Members: Wayne Anderson, president; Rick Van Bergen, vice president; Yvonne Hays, secretary; Mark Belford, treasurer. Board members: MFTA: Larry Halvorson, Rick Van Bergen, Yvonne Hays and Gary Metzger. HCARC: Mark Belford, Wayne Anderson, Wayne Skochenski and Ray Amundson. 2014-2015: A new well was installed on the north grounds in the spring of 2014. The ponds on the north grounds do not retain water during the summer/fall seasons, making water access impossible for fall trials/training. Positioning for electric power box and a well were established during the fall of 2013. The well is now operational. Also, the first phase of a tree/brush clearing project on both grounds was completed in the spring of 2015. This has opened new training and testing opportunities on both grounds. Finally, a building donated by Keith Hass was reconstructed to provide a “cook shack,” where food preparation and distribution is in a separate area from the storage cube, making for more efficiency in handling birds and distributing equipment during events. 2015 Officers/Board Members: Keith Hass, president; Rick Van Bergen, vice president; Yvonne Hays, secretary; Mark Belford, treasurer. MFTA: Rick Van Bergen, Yvonne Hays, Keith Hass, Bob Walker. HCARC: Mark Belford, Ray Amundson, Wayne Skochenski, Robbie Knutson.